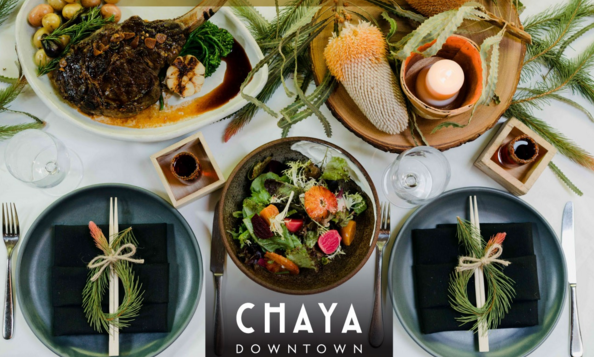 The Executive Chef Omakase Holiday Dinner presented by Japan America Society at Chaya Downtown, 525 S. Flower St. in Los Angeles, on Sunday, Dec. 10. Cocktails at 5 p.m., dinner at 6 p.m.
Four Chaya executive chefs, including a master sushi and kaisen chef from Japan, Katsuyuki Wako, will create a five-course omakase (chef’s choice) dinner with wine and sake pairings. Wako will be joined by Yuko Kajino, corporate executive chef; Joji Inoue, Venice executive chef; and Yuichi Natori, Downtown executive chef. The courses, which include wine and sake pairings, are King Crab Rice Cracker with kanimiso cream cheese; Maine Lobster “shinjyo” Mousseline with dashi broth, fennel; Madai Snapper Houba Yaki with ginnan, shimeji, yuzu miso, zenkouji shichimi; Binchotan Charcoal Grilled American Wagyu with dashi sunchoke puree, rockfoil shiitake, winter truffle; Matcha Opera with amazake ice cream. ABC7 Eyewitness News co-anchor David Ono will emcee. Seko Kujiraoka will provide koto music. Chaya opened in the early 1600s as a teahouse along a mountain pass near Kamakura. When the Imperial Summer Villa was completed in 1893, Chaya became the kitchen for the imperial family. Today, Chaya is one of the most exclusive Japanese inns and restaurants in Japan. The cost is $250 per guest, $2,300 for table of 10 (inclusive of tax and gratuity). For more information, call (310) 965-9050, ext. 104 or go to www.jas-socal.org.